For those who absolutely cannot escape from corporate America, I've got just the little book to help you cope and become a leader who turbo-charges vitality into an organization. 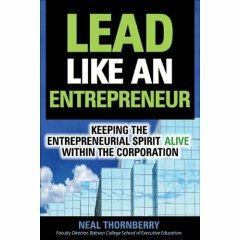 It's called "Lead Like An Entrepreneur" by Neal Thornberry, faculty director at one of my favorite entrepreneurial places -- Babson College -- renowned for its entrepreneurial education programs. Here's what I found most fascinating about "Lead Like An Entrepreneur" and I probably should not be giving away my insight so freely, especially on a blog, but I feel compelled to do so. Thornberry states: "Organizations don't make things hapen -- people do. And entrepreneurial leaders make significant things happen." This is the key premise to finding hidden value not just in the book but within any organization. Don't just get by. Thrive. And that's what "Lead Like An Entrepreneur" will do for you. Buy it. Read it. Learn from it. Become the entrepreneur you were meant to be ... whether within an organization or by building one of your own on "their" nickel.